In its early years, Vertigo tried to ignore the fact that several of its characters originated in — and thus continued to exist within — the DC Universe. But after his Vertigo series was cancelled, it didn’t take long for Animal Man to return to the mainstream DC Universe. Animal Man’s return to his more conventional super-hero roots felt appropriate, especially given how popular Morrison’s run had been in contrast to some of the more esoteric Vertigo storylines starring the character. Animal Man, back with blond hair and in his old colorful costume, began a string of occasional appearances in DC Universe titles. The Life Power Church of Maxine was altogether dropped. Less than two years after his final Vertigo issue, Animal Man reemerged in Aquaman, a mainstream DC Universe title. In Aquaman #35, the villainous Gamesman kidnapped Maxine, spurring Animal Man and Aquaman to defeat him and rescue her. Along the way, Animal Man helped Aquaman to realize that he too had elemental connections. While this transition back to conventional super-heroics might be seen as betraying Animal Man’s years at Vertigo, it was blessed by none other than Grant Morrison, who featured Animal Man in the relaunched and newly successful Justice League title, JLA. In Resurrection Man Vol. 1, this nostalgic reversal for Animal Man went so far as to place the character once again with the Forgotten Heroes, not seen since Crisis on Infinite Earths. This was especially appropriate because Resurrection Man starred a character very similar to Immortal Man, Animal Man’s teammate in the Forgotten Heroes (who had also debuted in Strange Adventures Vol. 1). In the midst of these occasional appearances, Animal Man returned to Vertigo in the one-shot special entitled Totems. There, he spent the last day of 1999 in the company of Vertigo’s other DC Universe characters — including Swamp Thing, John Constantine, Black Orchid, Shade the Changing Man, and others. In the larger 2005-2006 Infinite Crisis event, Animal Man was featured along with other super-heroes who went into outer space to address one of that crossover’s many threats. Animal Man appeared prominently in 2006-2007′s 52, the year-long weekly mini-series that followed from Infinite Crisis. 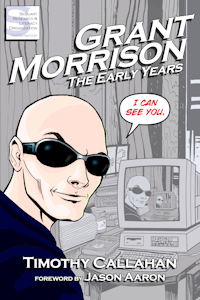 52 was co-written by Grant Morrison, who along wrote Buddy Baker’s dialogue. Taken together, these marked a return to prominence for Animal Man, who would appear more regularly afterwards. Animal Man appeared in 2007-2008′s Countdown to Adventure, in Justice League of America Vol. 2 #25, and in Justice League: Cry for Justice. In the 2009-2010 crossover Blackest Night, several resurrected heroes, including Buddy Baker, were revealed to be “inside agents” of Nekron, and Animal Man briefly became a Black Lantern. Animal Man would continue to make occasional appearances until the entire DC Universe was relaunched in 2011. During this period, the six-issue The Last Days of Animal Man, written by classic DC writer Gerry Conway, told the story of a middle-aged Buddy having his final adventure in the year 2024. While its exact relationship to DC continuity was unclear at the time, given the relaunch of the entire DC Universe, The Last Days of Animal Man may indeed be considered Animal Man’s swan song — or at least that of the current DC timeline, prior to its 2011 reboot. Tagged Animal Man, The Last Days of Animal Man.